New year. New style. New everything. That’s the Kevindo Menendez way. When you’ve worked in the bean industry as long as Mr Menendez you know when it’s best to stick to your guns and when to branch out into new territory. While his competitors will be falling back on traditional recipes and boring, predictable flavours in 2017, he looks to the future with a flashy star in his eye and an idea that will break your heart. Milky beans! All the goodness of milk mixed together with beans for a cockle-warmingly good time. You will get your daily portion of dairy and fibre from one single tin of ‘Kevindo Menendez’s Milky Beans’. 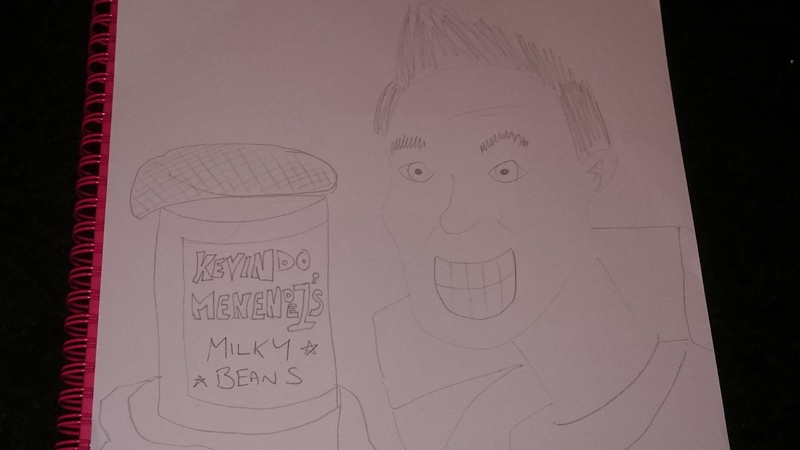 Even though his established, award-winning bean labels went for a more cartoony and playful look, Milky Beans takes that approach and dunks it in a tin of geese. Nothing says glim glam gloop like the Menendez one hundred billion dollar smile. Take a look at those pearly whites! No more queuing for hours to buy six pints of milk. No more waiting by cows for that perfect moment to strike. No more mixing tomatoes in with your cereal in the hope that it “works”. Milky beans have got your back. These sound awful, but… well, if the big K is selling them they must be good. Sign me up for a crate of them. Look at his face. You can trust that face. Whatever it tastes like, you can be assured that it is a quality item. Have you never wanted to try beans and cow juice together? Of course I have. I thought it was a sordid little dream, never to be spoken of in polite society. But like many sordid things, Kev has demonstrated to me that it’s OK to do these things in broad daylight. You mean like having a chain of cool? Did he have a chain of cool? Or did he actually have a cool of chain? I think it was the latter. I don’t know. You’ve confused me now and I wouldn’t like to say for fear of being shunned (not shinned, that’s not a real thing, despite my hands trying to tell you so). Yeah, very wise. Not only would I shun you, I would probably also deck and spurn you. You would hit me the three seven nine? The shun-deck-spurn? That’s a bit harsh. I mean if it were me, and if indeed I was me, I would only go for the two two four, the pat-pat-dishevel. Yeah. You know I would. But I won’t, because I am highly compassionate. What you are is in complete contradiction to what you said. Also, I don’t know what I’m saying anymore. Perhaps some milky beans might sort me out. It’s not contradictory at all. I would deck and spurn you so compassionately you wouldn’t believe it. I bet you say that to all your imaginary friends.